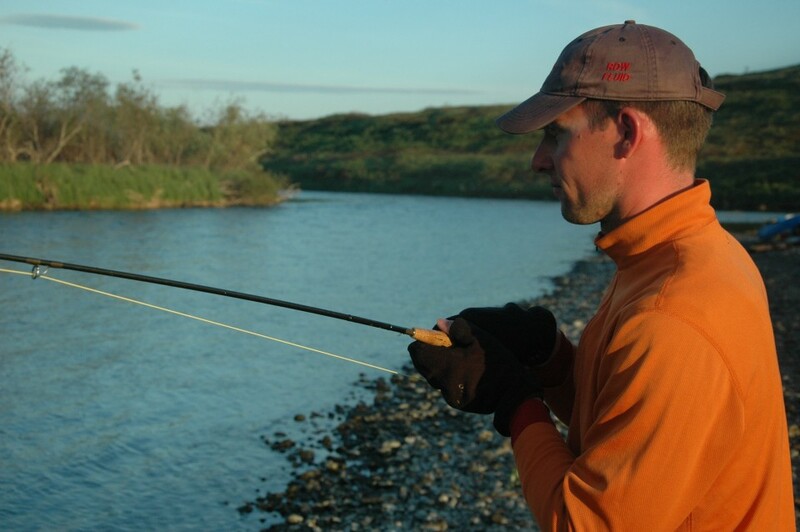 We started fly-casting mid afternoon the day we flew out. 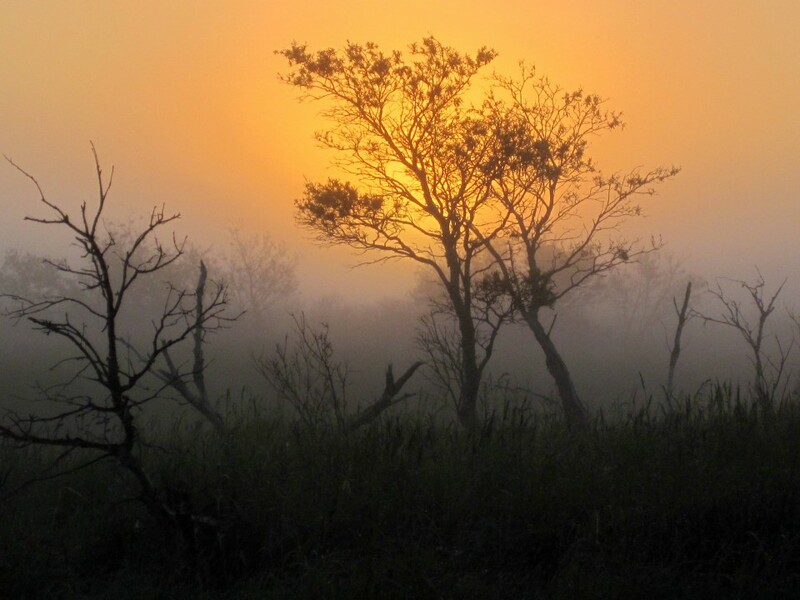 The flying weather that morning was fine and the barometer was high and rising. We were excited to be on the river. 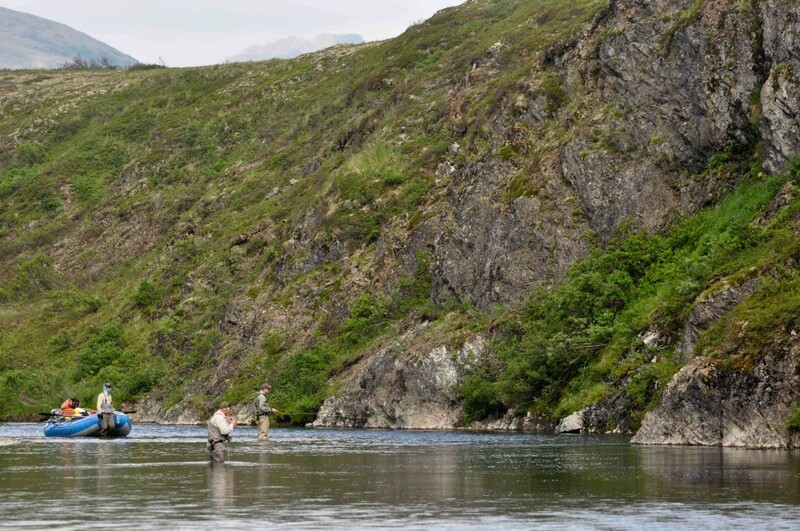 The upper river is shallow with some pools, which held small numbers of Chum and Sockeye Salmon, Grayling, Whitefish, and just a scattering of Rainbows. 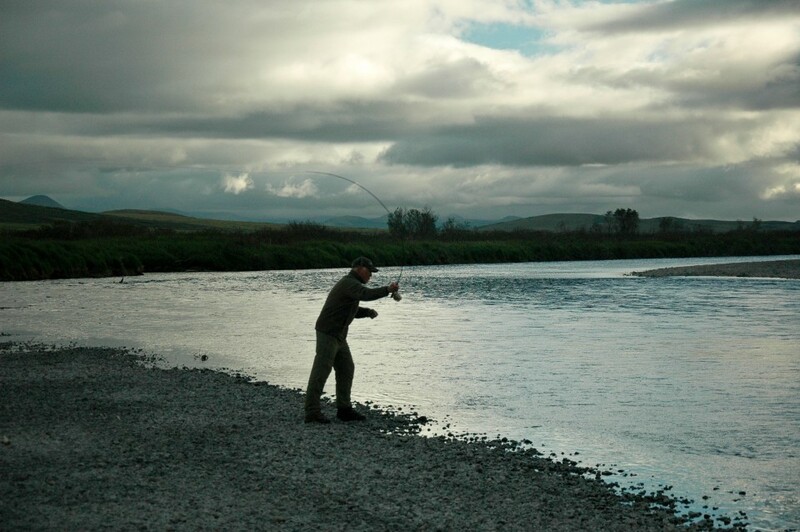 3 experienced anglers began casting streamers, and dry flies, searching and working slowly down river toward camp. 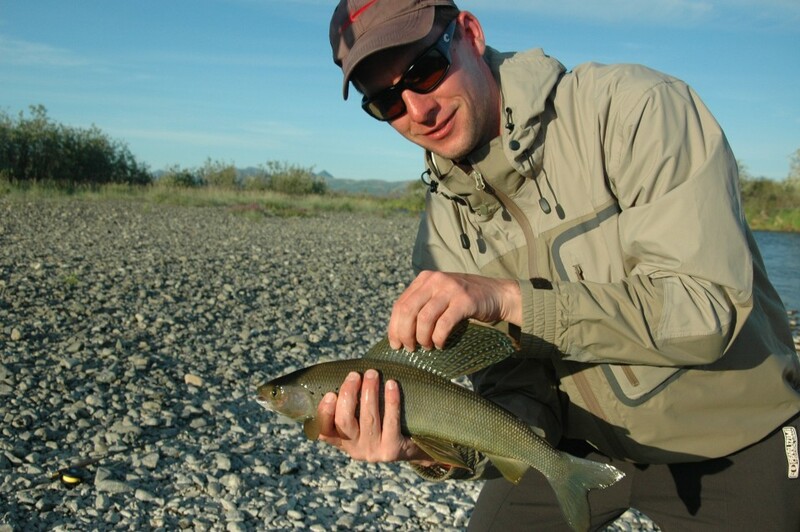 Dano McGinn from Northern California released a spectacular trophy Grayling taken on an olive Stimulator pattern. 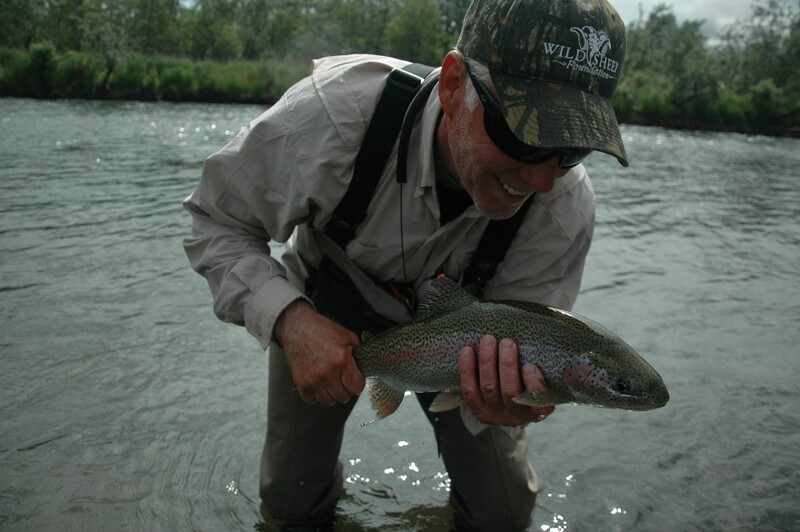 Tom Payne form Oregon took several of his Grayling on size 12 Mayfly patterns. Meanwhile upriver Michael Malone, of the DC beltway, had words with a Brown Bear who was sharing the fishery with him. Both the bear and Michael agreed find other water. 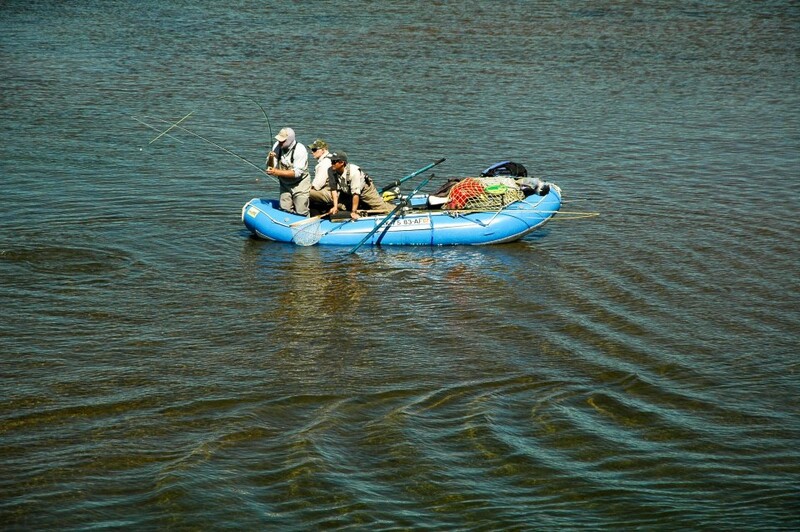 Each of the anglers had lots of prior experience. 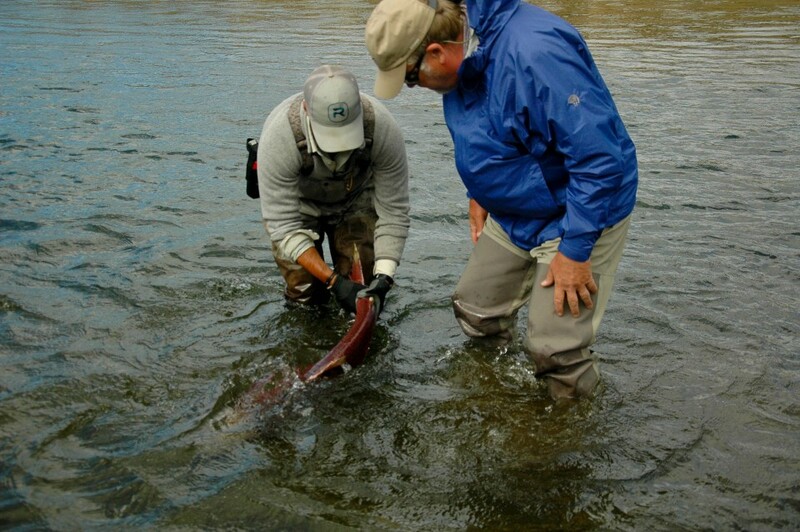 Dano brought dry fly tactics from the high Sierras and the Great Basin. Mr. Malone grew up sight fishing for largemouth bass with wooly buggers in Northern Wisconsin, and Tom Payne swinging flies for Steelhead in coastal Oregon. Still they each had to adapt their technique to the conditions they found on this river. 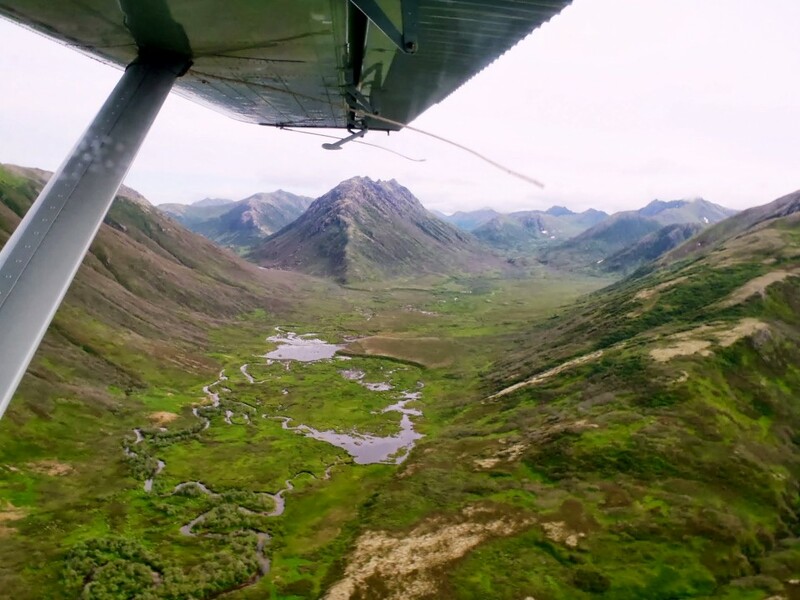 This week we found Gin clear water and schools of salmon staged in quiet water below islands. But at least initially the Grayling, Dolly Varden, and Rainbows were scattered. 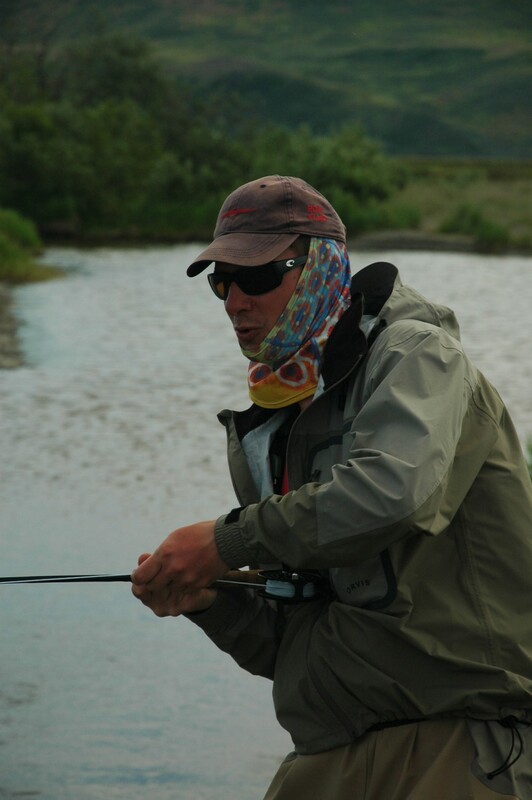 It was not so easy finding fly patterns that worked consistently, nor locating fish in the lovely but shallow headwaters but the challenge gave us a focus. 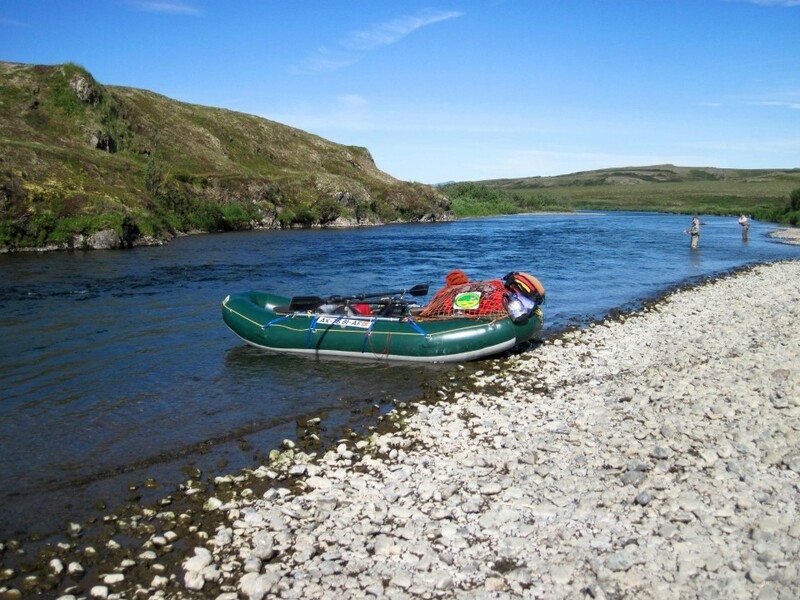 We were searching with casts and experimenting with flies from the raft and while wading. We were hunting for knowledge as much as anything. Throwing weighted streamers, dry flies, and egg patterns we searched to understand where the fish were located. 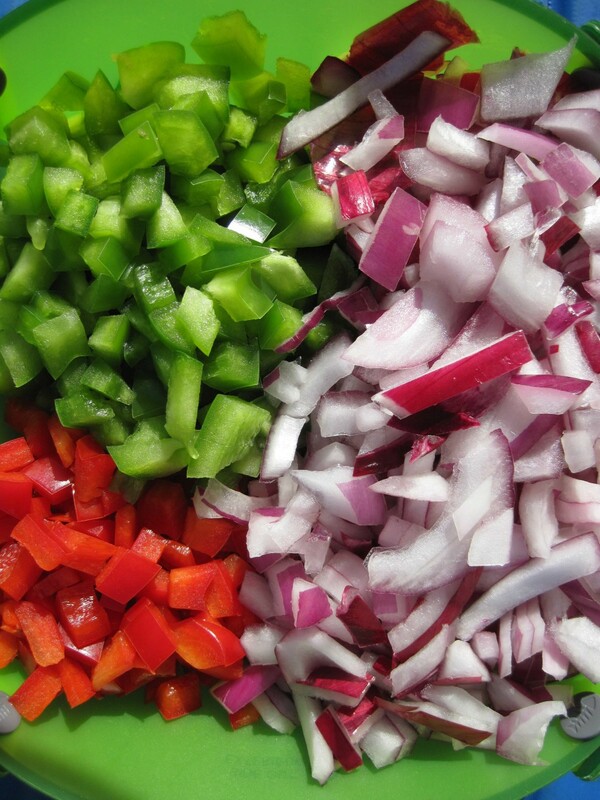 Were the Rainbows in the deep channels or near the salmon? Had sea run Dolly Varden migrated up into these headwaters yet? Was the Grayling distribution coherent? 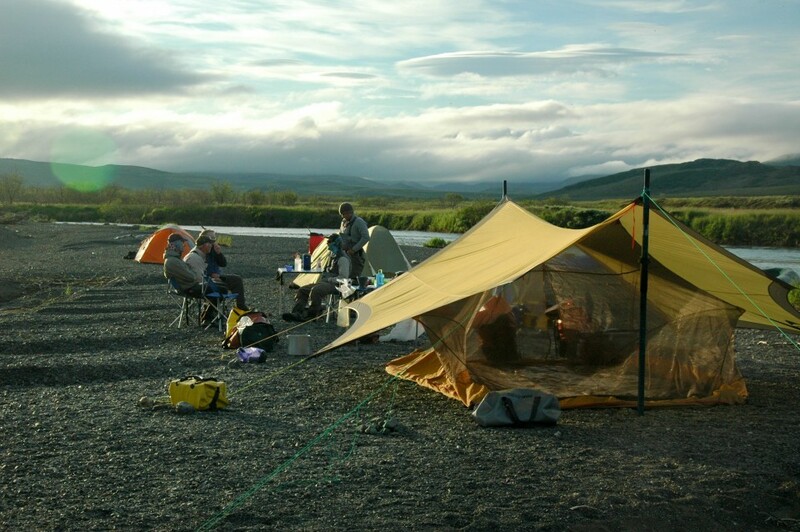 The first day ended with our camp set on a fine gravel bar with Sockeye porpoising nearby. We had overnight rain showers, which cleared at breakfast, and by mid day we were sweltering, overdressed, shedding layers. By the end of that second day we’d answered some of the questions about fly pattern effectiveness and where the fish were distributed. Tom took a notably fine Leopard Spotted Rainbow trout on the second morning swinging a streamer much as he would for Steelhead. As we waded the gravel bars we saw pairs of nesting Least Sandpipers and were screeched at by Arctic Terns defending their nests. 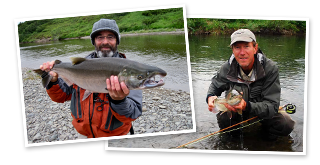 Dano, Tom, & Michael determined that the Dolly Varden Char migration had progressed well upriver since they took a few large fish on streamers, then discovered that what the Dollies really wanted was a single egg. 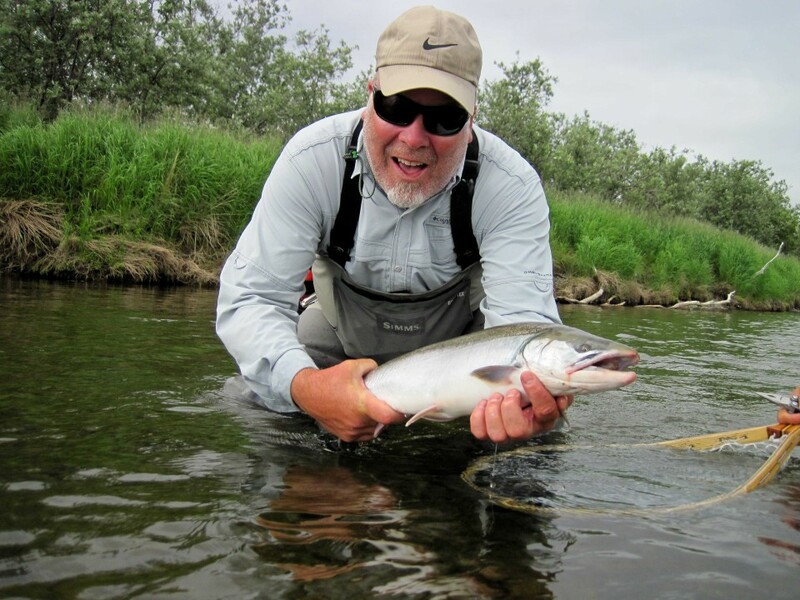 The Char really craved a pearlescent or pinkish color trout bead drifted near Chum Salmon. 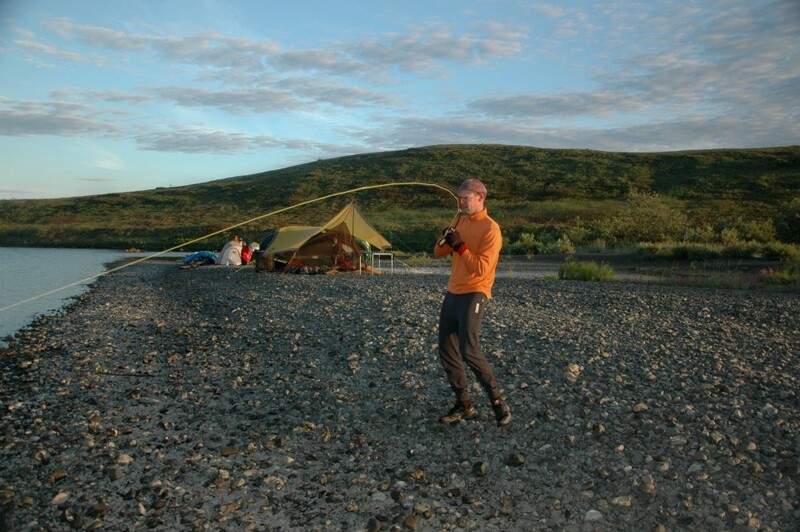 At camp the second night the fishing was excellent for Dolly Varden but I think what we all remember most about that spot was the hour we watched a Brown Bear graze on the hillside right above camp. 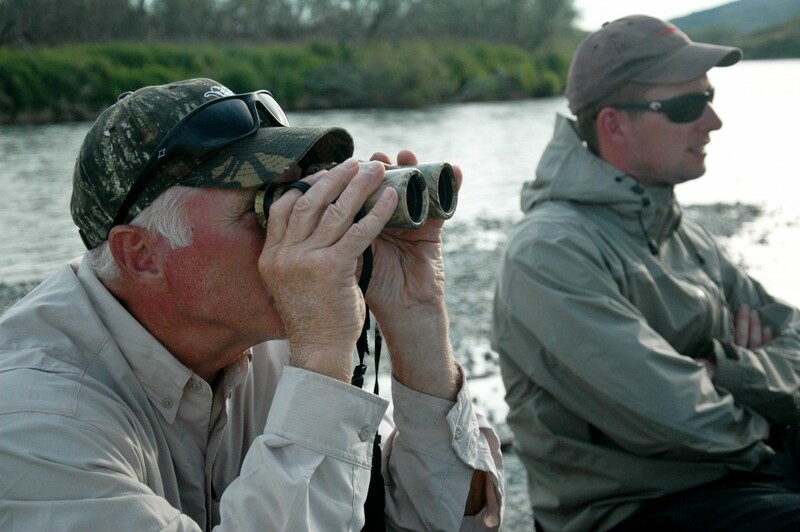 Dano, a professional big game hunting guide, passed his binoculars around. The light was perfect and the bear was aware of our presence, but she had enough spatial separation that she felt comfortable and so did we. By the end of the third day we’d seen 7 individual bears under fine conditions. With the bears it’s common to oversimplify their salmon fishing behavior and even the importance that salmon play in their diet. 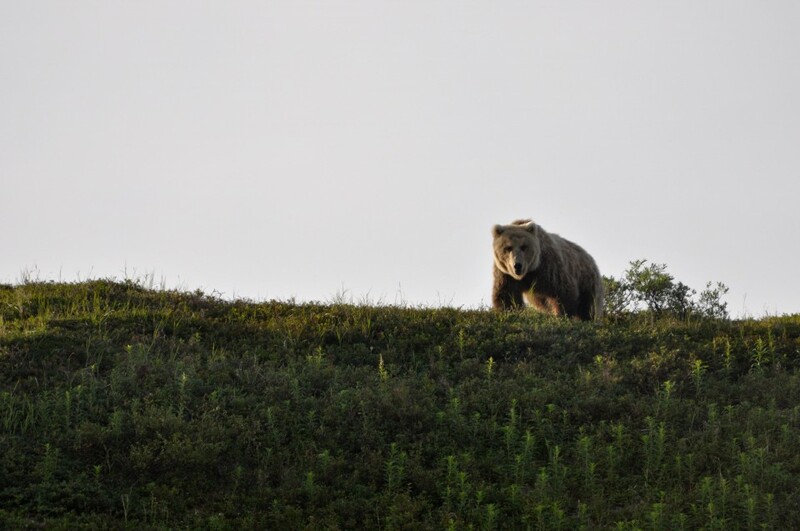 Many of us imagine that large bears and small bears, sows with cubs and big the males, as well as adolescents spend the summer at the river, scooping up a salmon and repeating as often as necessary until autumn and the onset of winter denning season. 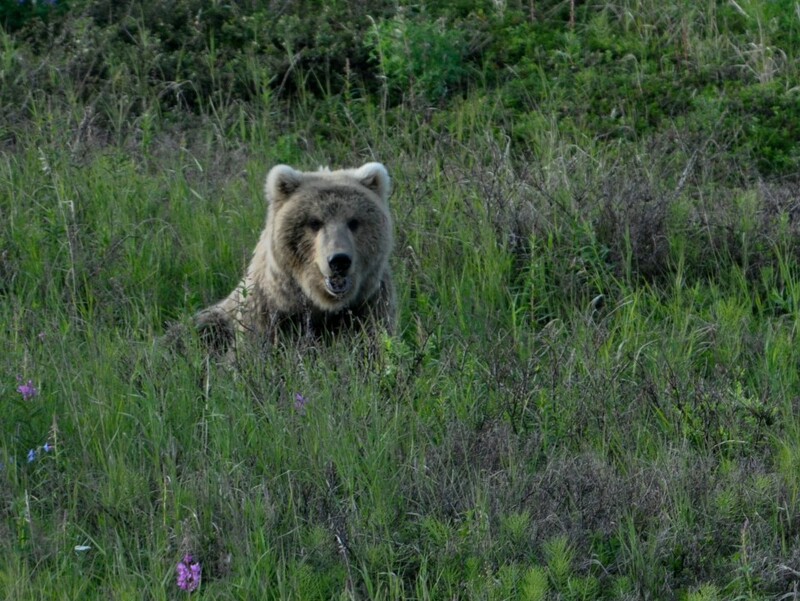 If we give the bear’s lifestyle any more consideration it is mainly about our personal safety. 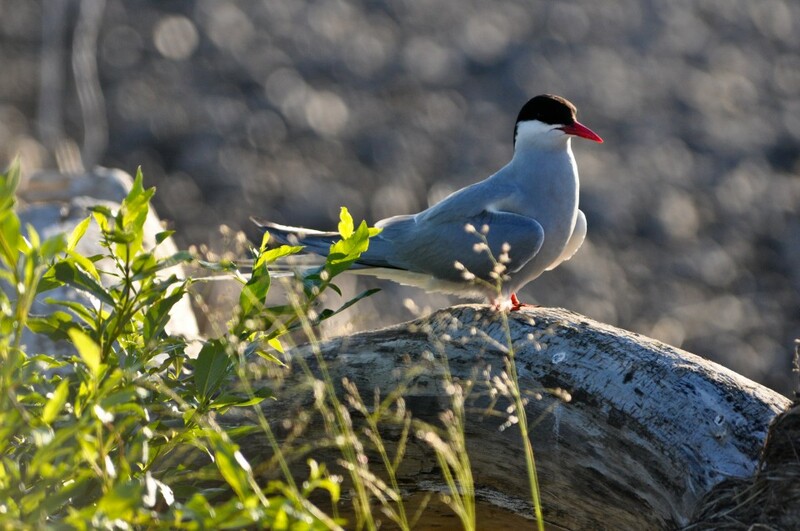 What you learn by observing them over the decades is that the fishing is not that easy for them and they remain very dependant on grazing grasses, sedges, and other herbs most of the summer. True- during the peak of the Salmon run from mid July through high water in mid August they take several salmon per day and the cubs scavenge many spawned out carcasses, eating mainly the fatty brain. But throughout the snow free year the bears are consistently seen grazing. 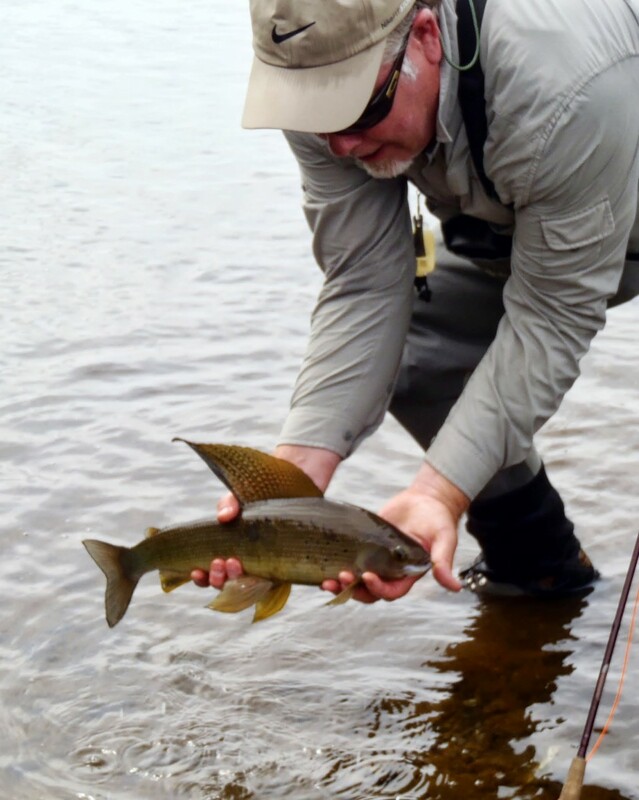 In the mid river the fishery changes from a relatively sparse resident Grayling and trout fishery to a richer nutrient laden aquatic ecosystem. 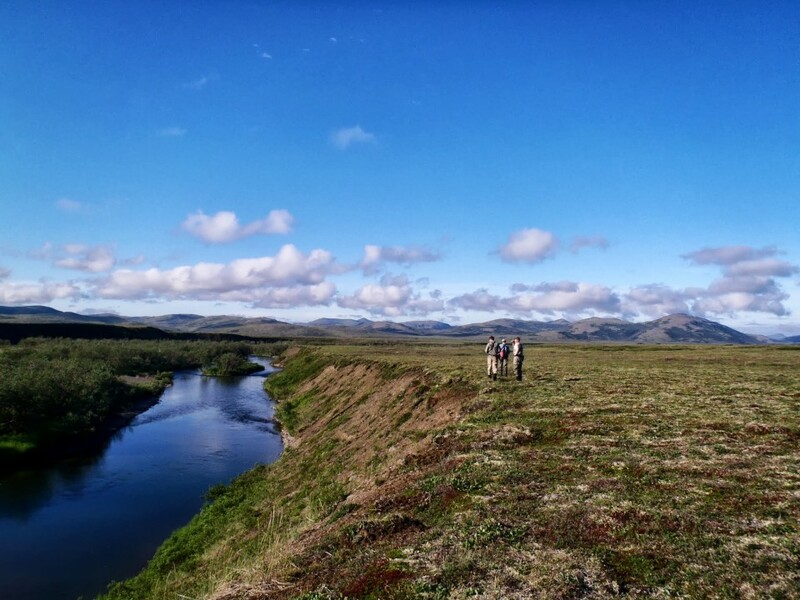 On day 3 we passed through several “living shoals” where hundreds of Dolly Varden staged in pools and flats awaiting the Chum and Sockeye spawn. 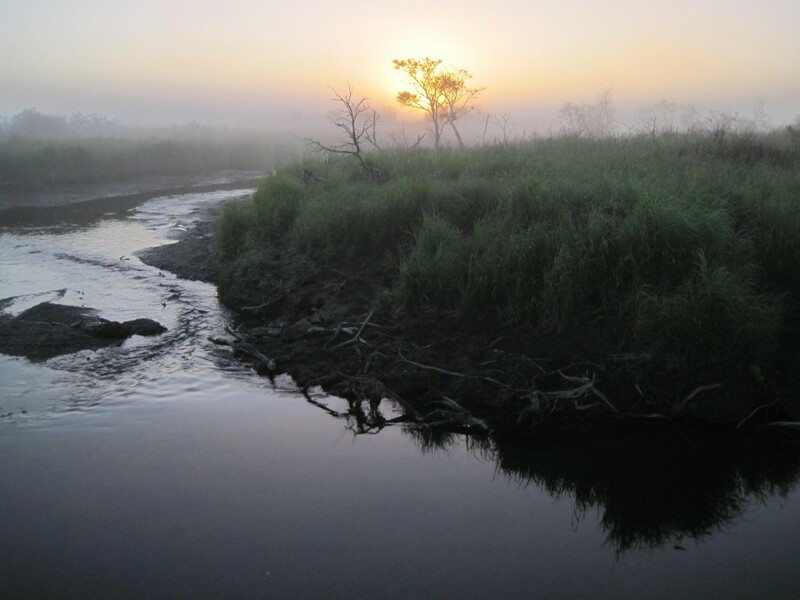 The mid river water flows slow down and the river alternates between bedrock bluffs with long rocky pools and oxbow meanders. 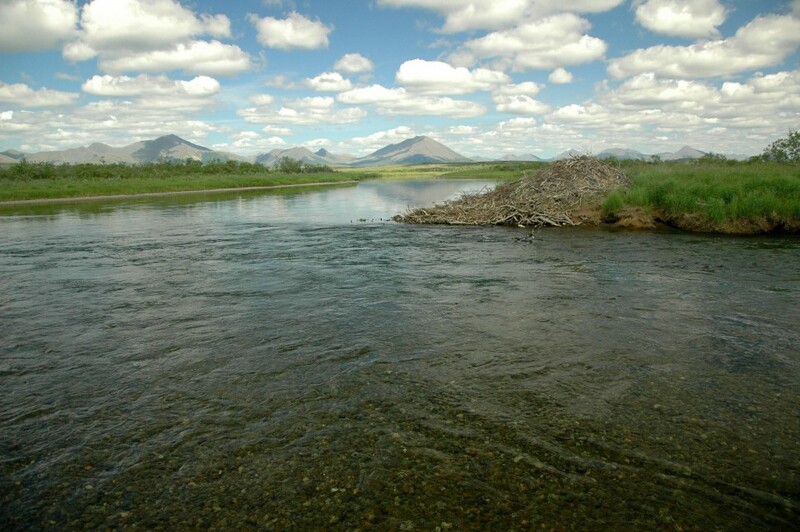 The gravel size in the sinuous meanders is ideal salmon spawning substrate. 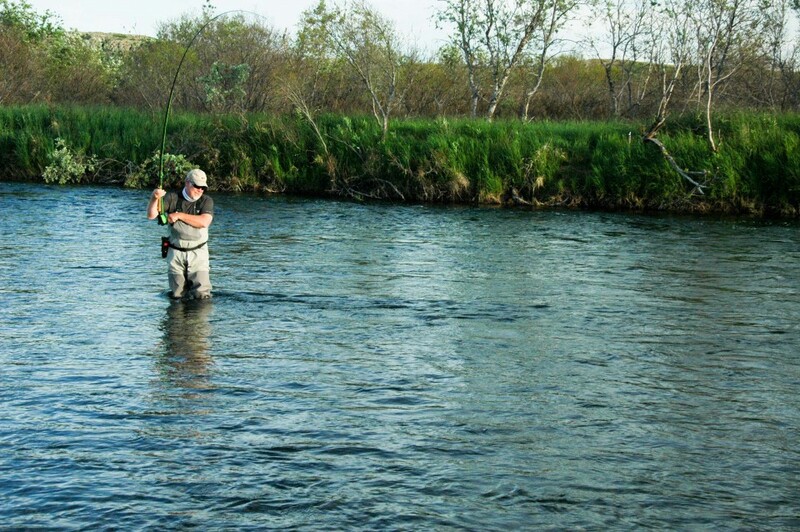 To fish the mid river effectively can require 2- or some prefer 3- fly rods. A 7+ (7-9) wt. 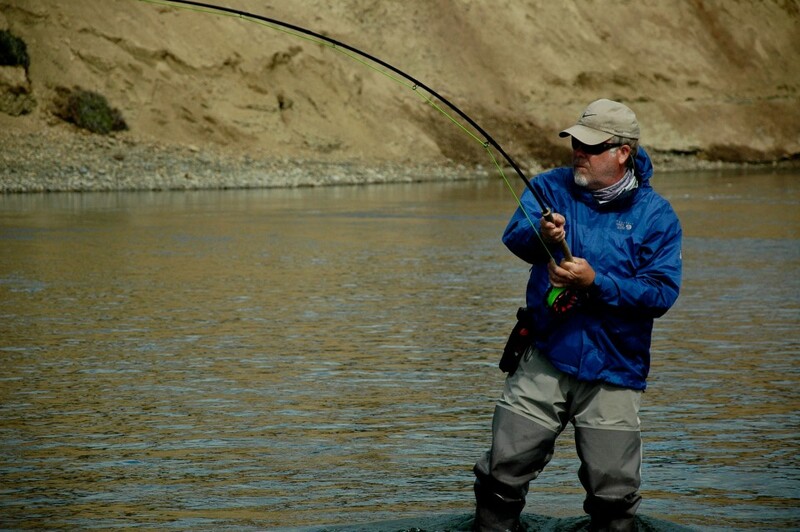 rod rigged with big streamers for Kings, Chum, Sockeye, or early Coho. A 5-6 wt. rod dedicated to Dolly Varden, Grayling, and Rainbow with a trout bead for efficient catch and release. A third rod, a 7 wt. might be rigged for Rainbow Trout with an attractor pattern such as an egg chasing sculpin or large bunny strip leech. 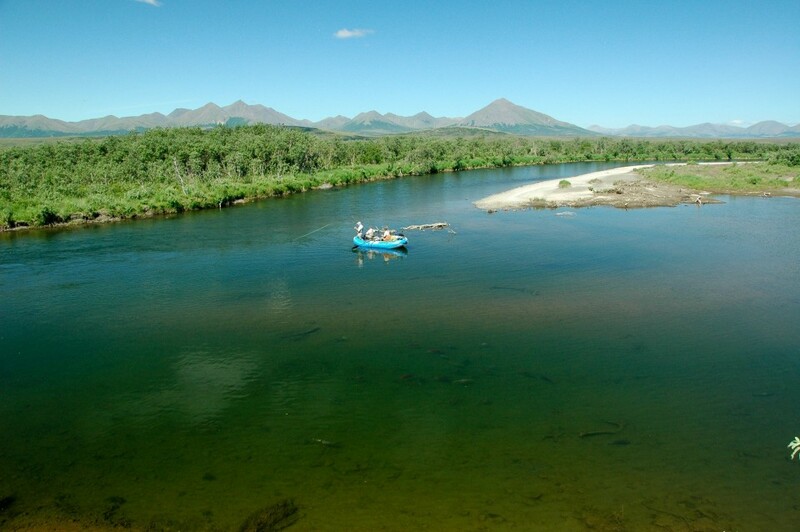 The idea is to regularly change rods and flies as the habitat changes. 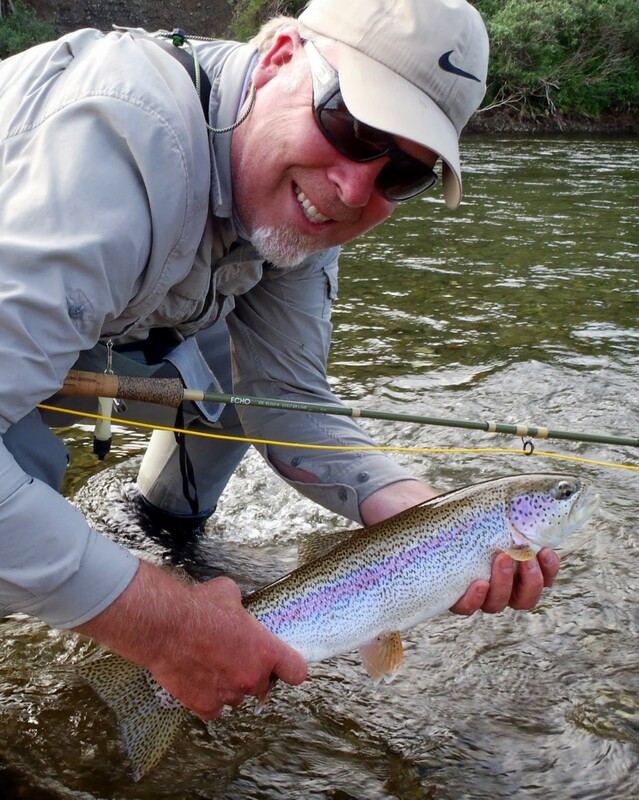 In our case as we passed from salmon pools into the shoals of Char we put down the big rods and cast beads and then among the meanders we searched for Rainbows with streamers. 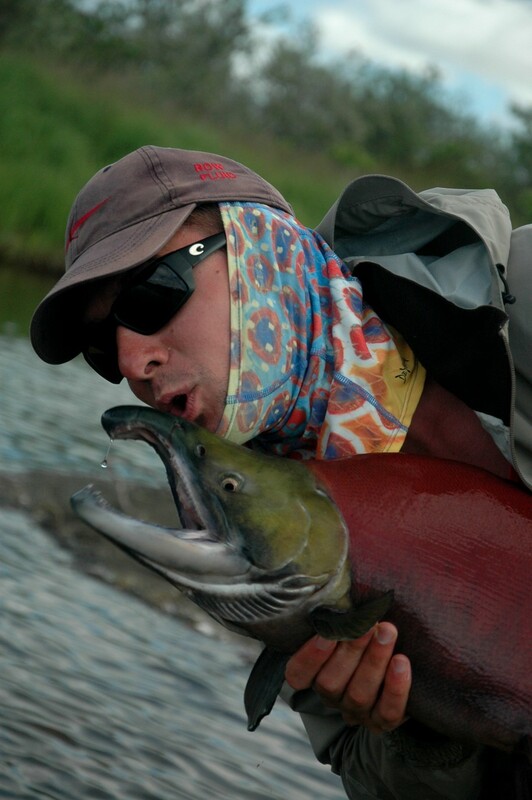 Tom released a 30-pound King Salmon taken at lunch swinging a fly with his switch rod. 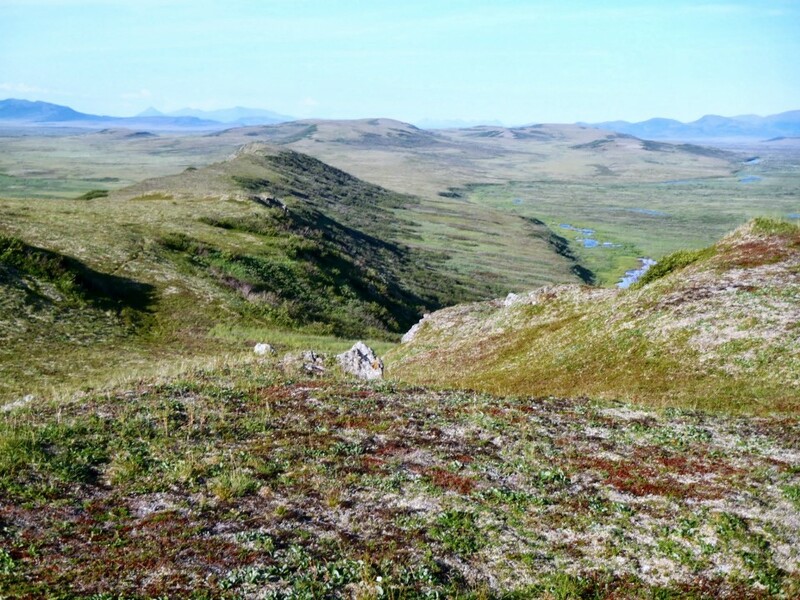 From the log of July 23, 2013: “As we floated we saw Brown Bears, fresh Wolf tracks and a Moose. If you weren’t paying attention you’d pass by without noticing the carcass of the first naturally spawned out Chum Salmon of the season being eaten by a Raven.” This carcass was different from the other “bear caught and partially consumed” carcasses that the Ravens and Gulls had been scavenging after the bear departed. This carcass floated down stream as the fish expired post-spawn, and came to a final rest on a gravel bar where a Raven family tore it apart. The appearance of this expired spawned out carcass marked the beginning of the peak of salmon spawning which every Alaskan angler is seeking. The fishing was about to change from excellent to mind-boggling. The size of the Sea Run Dollies in 2013 was noteworthy. The number of fish greater than 22 inches was remarkable. Tom lost track of the number of Char he landed on day five after counting 30. 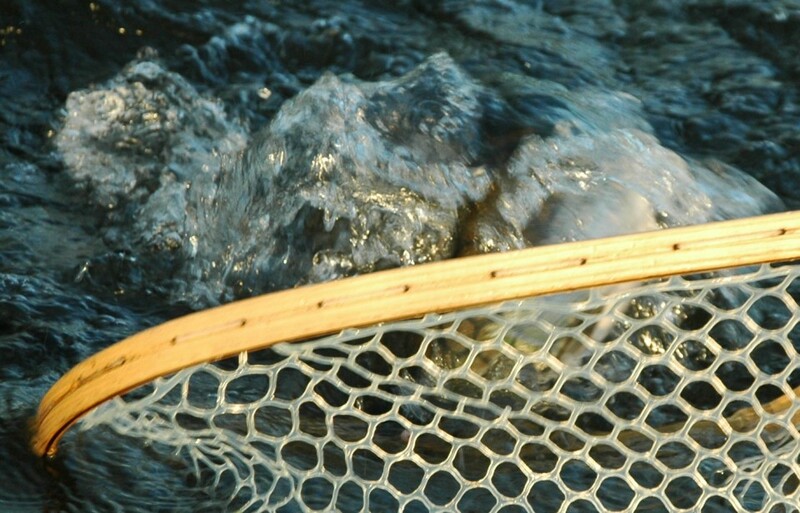 We stopped at the tail of a long pool with a vast array of Char, Grayling, and Trout oriented around spawning Chum. 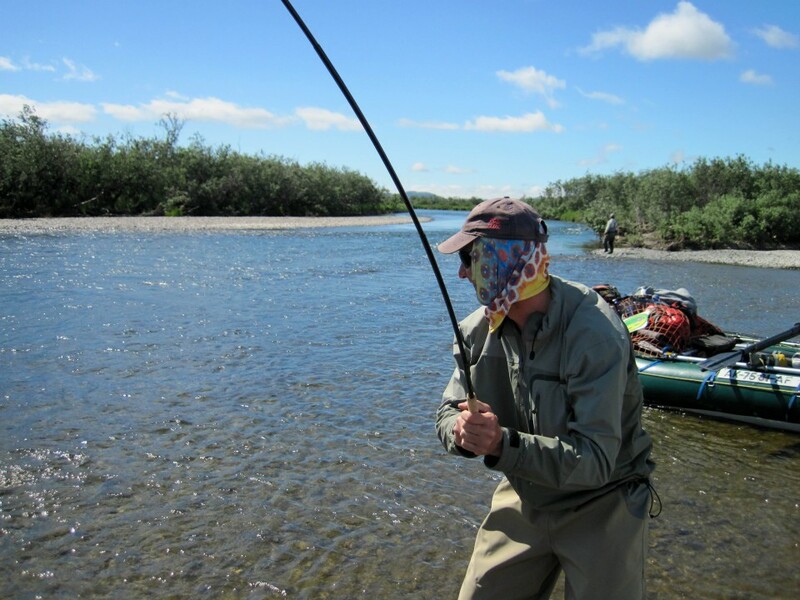 The sight casting was as strong as anything one could hope for on a trip to Alaska. 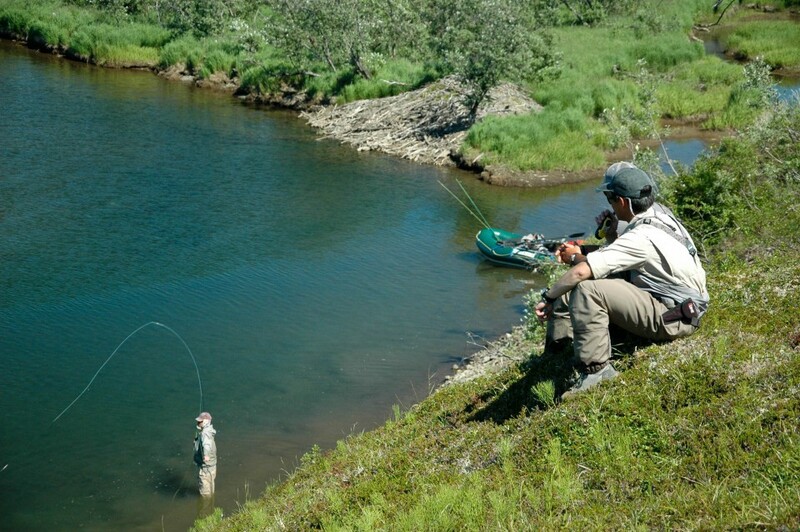 Rainbow trout were taken but only when you made a cast that a Char did not intercept first. Toward evening Michael used his prized Tenkara rod to take some lovely trout and char. We camped there and had one of the most extraordinary evenings of the summer. 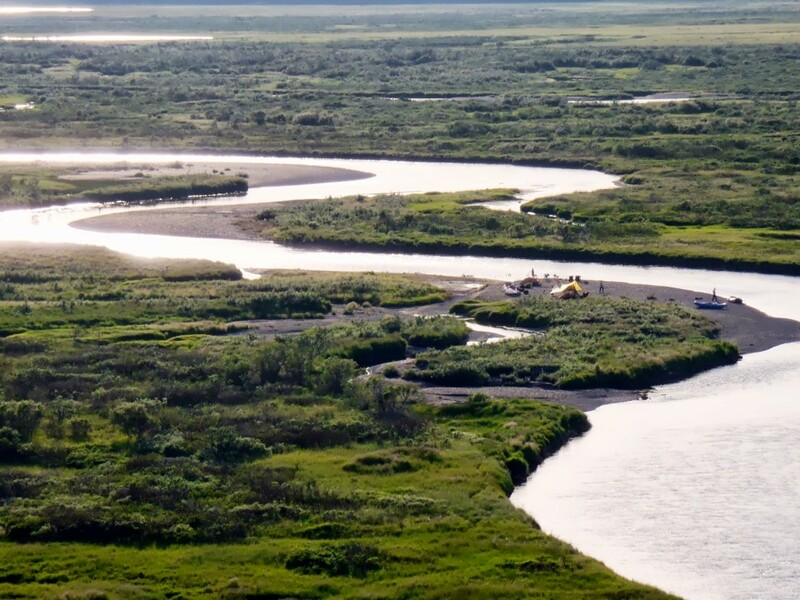 As we floated and cast down into the lower river at the end of our week we passed beyond the prime Char and Rainbow water and the fishery was given over to salmon staged in great pools near Beaver lodges. We’d rafted and fished more than 40 miles and took time now, to sit and look across the landscape toward the mountains we’d come. We beached the rafts and gazed into the salmon rich pools and watched migrating Dolly Varden Char move steadily upriver. The week ended at a camp in the lower river where the river water was a comfortable temperature to swim in but was too warm to hold fish. We celebrated with a meal of fresh Coho Salmon. Dano hooked and landed that fish, his first Coho/ Silver Salmon in a classic pool defined by a large Beaver lodge out on a truly vast Alaskan landscape. A spectacular week ended.